Another dish I made very often while living in France was this vegetable soup. Made with a few simple vegetables and herbs, it can be served as a first course or as a meal in itself. It’s the turnip that gives the soup its full flavor. This is not the traditional French version which is made with summer vegetables, but a soup made with vegetables easily found in France, topped with pistou. 1. Sauté carrots and leeks in a large soup pot with oil for 15 minutes. 2. Cover with water, so that water level is 1 inch higher than vegetables. Add turnip and parsley. 3. Cook, covered over low heat until all vegetables are soft. 4. Remove from heat and purée in blender or with a hand mixer, slowly stir in add soy milk to thin and give desired creamy texture. 5. To make the pistou, finely chop basil and garlic and place in a small bowl or jar. 6. Add 1/2 cup olive oil to the garlic and basil and blend ingredients together well. Pistou may be refrigerated. 7. 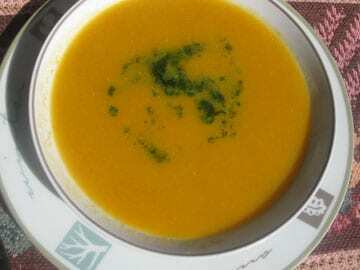 Serve soup and top with a tablespoon of pistou. Watch the videos below for making the soup and the pistou.